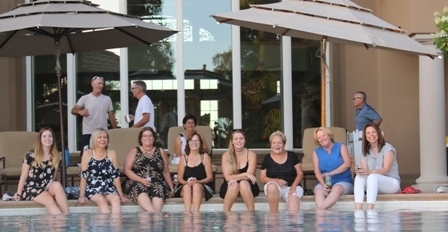 (Photos courtesy of Jane Burkitt) The Sacramento MSBL held its 12th annual Hall of Fame banquet on Saturday July 14. 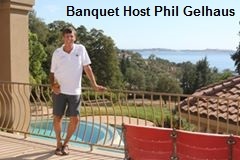 The affair was hosted at the beautiful home of SMSBL hall of famer Phil Gelhaus. 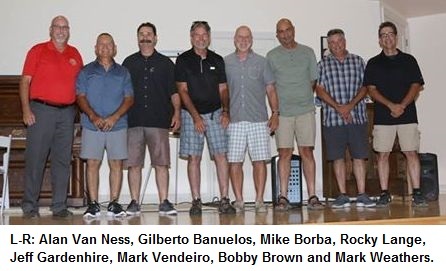 We inducted eight well deserving players: Gilberto Banuelos, Mike Borba, Bobby Brown, Jeff Gardenhire, Rocky Lange, Mark Vendeiro, Mark Weathers and SMSBL president Alan Van Ness. They were recognized for their league and national championships, board and community service, and overall contributions to the success of the SMSBL on a local and national level. Each inductee received the Hall of Fame polo shirt, jacket and certificate, all named and dated for 2018. Their brass name plates were then placed on the Hall of Fame plaque. The evening was filled with tributes, humor, and moving introductions and acceptance speeches. Over 150 players, friends and family attended. They have joined a Hall of Fame fraternity of over 100 others since the league’s inception in 1988. SMSBL hall of famer John Rice catered the evening’s dinner consisting of Tri tip, chicken, salads and all the fixings. Congratulations to the eight inductees and thank you for your contributions to the SMSBL!